Courtesy of Stellar Realty Northwest. 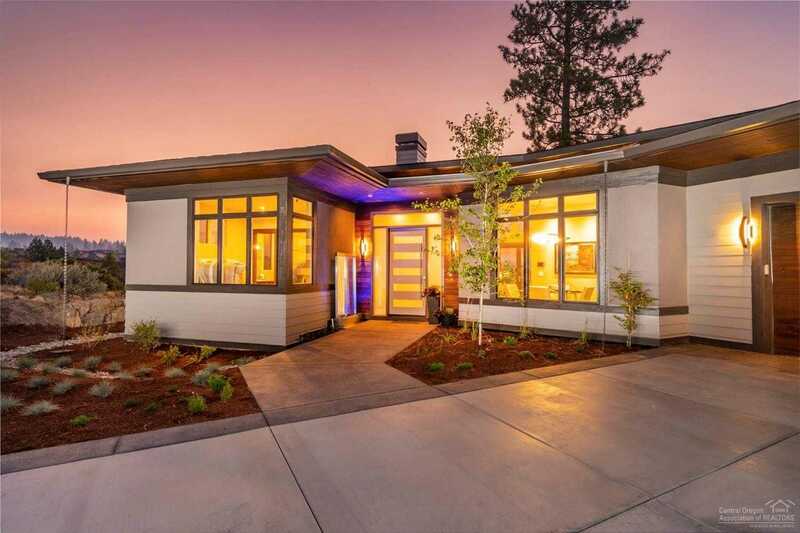 Stunning custom built modern, mid-century Tetherow home that is truly a work of art! Unique, high-end details are too much to list, you must see for yourself! Premiere .66 acre lot takes in breathtaking views of Cascade mountains, 2 golf course lakes, and Tetherow fairways. Waterfall feature at entry, 17 ft ceilings in Great Room w/ 12 ft folding glass doors, gas fireplace with mid-century floating hearth. Chef’s gourmet kitchen boasts gray honed granite island and counters, Bosch appliances, Kona cabinetry, large pantry. Dining room with built-in bar, and modern LED chandelier. Dramatic/spacious Master Suite with walk-through shower, luxurious soaking tub, walk-in closet with custom Kona built-ins. Two impressive guest suites with gorgeous ensuite baths. Oversized Rec-room w/ pool table for entertaining. 2 car tandem garage w/3 coat epoxy floor, plus separate driveway for golf cart w/ access to huge shop/studio, and storage space. Purchase price includes Tetherow membership. Please, send me more information on this property: MLS# 201811028 – $2,097,500 – 19250 Christopher Court, Bend, OR 97702. I would like to schedule a private showing for this property: MLS# 201811028 – $2,097,500 – 19250 Christopher Court, Bend, OR 97702.